The Bill Cosby mural at Ben’s Chili Bowl has been defaced. As in, literally. 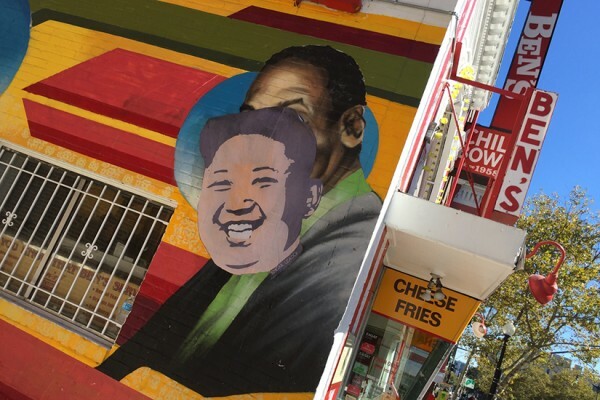 A street artist going by the name “Smear Leader”affixed the grinning visage of Kim Jong Un on top of Cosby’s head some time within the past 24 hours. The artist took credit for the piece earlier today on Instagaram. Why Kim Jong Un? As detailed in a recent interview with The Daily Beast, vandalizing things with Kim Jong Un’s face is kind of Smear Leader’s thing. When asked whether he was afraid of being identified on the eatery’s security cameras, Smear Leader said, “as far as the security camera thing goes, I was aware of that but the fact that they still have that monster Cosby up on their mural is a risk worth taking. A representative from Ben’s Chili Bowl was not available to comment.